Scratched scabs, healed wounds, a stockade built of words. I watch your hand sliver across the azure paper. Your college teacher called your writing feline. Perhaps she’s right, but leonine seems closer to the mark. of your Cyrillic wisdom, learnt in country towns. calligraphy that speaks the language of your soul. I long to share the knowledge of your flowing hand. I learn to speak a woman’s body’s peace. 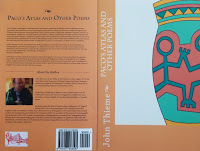 John Thieme is a Senior Fellow at the University of East Anglia (UK). He previously held Chairs at the University of Hull and London South Bank University and has also taught at the Universities of Guyana and North London and, as an annual Visiting Professor, at the University of Turin. 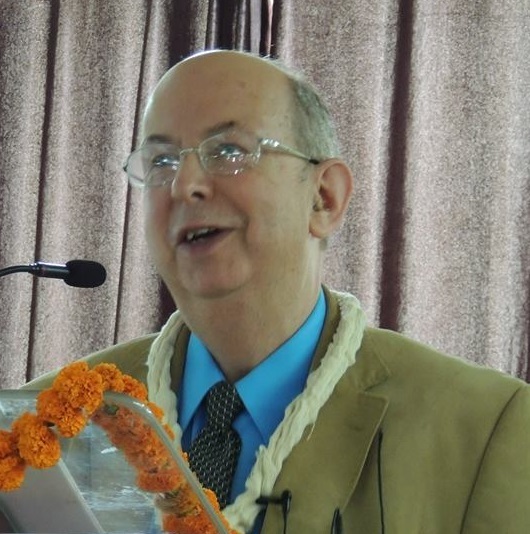 He has held honorary positions at the University of Hong Kong, the Open University (UK) and the University of Warwick. His books include Postcolonial Con-Texts: Writing Back to the Canon, The Arnold Anthology of Post-Colonial Literatures and studies of Derek Walcott, V.S. Naipaul and R.K. Narayan. His most recent critical book Postcolonial Literary Geographies: Out of Place came out in 2016. His collection Paco’s Atlas and Other Poems was published by Setu in 2018, and his novel The Book of Francis Barber also appeared in that year. 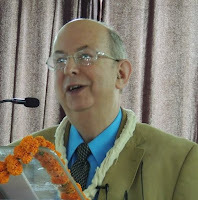 He was Editor of The Journal of Commonwealth Literature from 1992 to 2011 and is General Editor of the Manchester University Press Contemporary World Writers Series. His creative writing has been published in Argentina, Canada, Hong Kong, India, Italy, Malaysia, Mauritius, The Netherlands, the UK and the USA. His stories “The Word” and “Apples” have been published in Setu. I met John Theime recently at a ‘Poets Meet’ in Kolkata. In this free-wheeling conversation with me, John has opened his heart and talked about his childhood, his academic career, his poetry and fiction, his role as an editor and enlightened us on the challenges of Post-Colonial and Global Literature. Gopal Lahiri: Very briefly tell our readers about yourself? Your life as a poet, writer and a scholar? John Thieme: I was born in London and lived most of my early life there, though my father was Canadian and I lived in Canada for a year as a young boy. As a teenager, I wanted first to be a creative writer, particularly a novelist, then a journalist and then an academic. I’ve more or less achieved these ambitions in reverse order, though I still feel unfulfilled as a novelist. I’ll explain as we go on. I’ve written poetry and short fiction since I was young and one of my earliest poems, ‘Nosferatu’, composed when I was still at school, is included, with minor changes, in my collection Paco’s Atlas. But until recently I never thought of myself as a poet – more as someone who wrote poetry as a pastime. That’s changed a bit in the last ten years, though. Most of the poems in Paco’s Atlas have been written in these years, during which I’ve taken my verse more seriously. I get lots of ideas for poems, begin them and then discard, or fail to complete, about half of them as unsatisfactory. I usually finish any piece of fiction I begin, whether short or long, but I take time to do so, because I want every word to be perfect …. and of course, it never is! My academic career is easier to talk about, in terms of precise details. I have three London University degrees and began my career as a specialist on Eighteenth-Century English Literature. I still love reading eighteenth-century writers – Swift, Pope and Sterne in particular. My first job was at the University of Guyana, where I taught a very broad range of English, American and world literatures. I was lucky enough to be appointed there when I was just twenty-four. I think I was extremely callow at that age, but grew up rapidly. By the time I was twenty-five I felt several years older! I owe a tremendous amount to my years in Guyana, both personally and academically. I was there for five years. I had wonderful students and perhaps most importantly those were years that taught me that aspects of life that I’d thought of as “natural” were in fact socially constructed. I think that experience has enabled me to read across cultures in a way that I wouldn’t have been able to otherwise, or at least not to the same extent. Those were also years when I developed my interest in Caribbean literature. The University’s library’s holdings were limited, but there was a good Caribbean Special Collection and I read my way through most of the literary works in this. By the time I’d done this, I was ready to venture writing criticism in the field. I was struck by the comparative neglect of non-British and American Anglophone writing and felt a strong degree of motivation to play a part in remedying this situation. Caribbean Lit. apart, this was where I first taught what was then called “Third World Literature”. That included R.K. Narayan, whom I first encountered when I taught The Man-Eater of Malgudi and found it very popular with students. I continued to read Narayan over the years, and eventually wrote a book on him. In the second half of my time in Guyana, I wrote regular feature articles for one of the national Sunday newspapers. These were on all kinds of subjects – social issues as well as literature and the arts. Anything and everything. I wrote a lot on film. I became reasonably well known outside the University and again was very lucky in that I got to meet many of the most interesting and influential people in the society, while managing for the most part to keep clear of the politicians! Back in the UK, I worked for many years in London at another job, which I realize in retrospect contributed enormously to my academic development, though at the time I was too busy to stop and think about this. I learnt a vast amount from my colleagues and students and I began to write much more extensively, first on Caribbean literature and then on what at that time we were calling “New Literatures in English”. Then, at a fairly young age, I was appointed to a Chair at the University of Hull, which was a major promotion for me. Subsequently I had a similar position back in London and after that I worked at the University of East Anglia in various positions for a number of years. Now I am a Senior Fellow there. At UEA I got to supervise a number of Creative Writing postgraduates and that has made me reflect on the processes of writing to a greater extent than I had previously. For the most part I’m an instinctive writer, though I’m conscious that I exercise a good deal of control when writing fiction. GL: Why do you write? Does it come naturally to you? JT: I find it hard to say why I write, because I do it compulsively. I’m always writing in one form or another. So, yes, it does seem to come naturally. I can’t remember a time when I didn’t write. I suppose, though, that I should say that first and foremost I enjoy the activity of writing. It’s wonderful to be published, but for me that comes second to the pleasure of putting words on paper, or now on a screen. Perhaps it’s therapy for me. I don’t know, but when life’s pressures seem to be piling up, I get to the laptop, key in a few words and feel more relaxed. Sometimes I look at people with pathological tendencies that lead them to become obsessive in particular areas of life, and then I have to ask myself whether I’m like that with writing. But anyway, it’s both work and pleasure for me. I’m happy writing in all forms: fiction, poetry, academic writing, journalism, reference work entries, reviews. 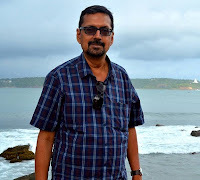 GL: You are an eminent academic and you have particular interests in Anglophone Caribbean Literature, Canadian fiction and Indian writing in English. Tell us about your interests especially on India and Indian writing in English. JT: Well, I’ve mentioned how I developed my interest in Caribbean writing. I’ve been particularly interested in the major Caribbean writers of “the independence generation”, those who came to the fore in the years just before and after the various Caribbean independences. My first book was on V.S. Naipaul, a writer that I’ve become increasingly disenchanted with during the last couple of decades. Over the years I was always reading Derek Walcott, mainly for pleasure, and eventually I decided to write a book on his work. I particularly wanted to do this, because I felt that, unlike his poetry, Walcott’s plays hadn’t received the attention they deserve. So, I’ve published books on the two Caribbean writers who, years after I first read them, would go on to become Nobel Laureates! But I’ve published less extended pieces on virtually all the other major writers of their generation. I was friends with Sam Selvon and Wilson Harris, Guyana’s most acclaimed writer, who sadly passed away last year. I greatly admire the work of George Lamming, Kamau Brathwaite, Olive Senior, Erna Brodber and Earl Lovelace. As I said I first read so-called “third world” writers in Guyana. Then in the 1980s I began to read much more comprehensively in those areas. I’ve written very little on African writers, though at that time I read a lot. Now, with a few exceptions, I don’t feel I have the necessary expertise. Indian writing is a different story. Although I’ve never lived in India, I’ve visited many times. From Narayan, I graduated to the other two members of the “Big Three”, Mulk Raj Anand and Raja Rao. I’m an admirer of Anita Desai’s work and, as I expanded my knowledge, I read many of the poets. I developed a particular interest in Nissim Ezekiel’s work and wrote on him after meeting him two or three times in London and Mumbai, and I’ve also been a keen reader of Jayanta Mahapatra’s poetry. I met most of the leading figures of the generations that came to the fore in the 1930s and the years after Independence, with the exception of Narayan who was the novelist who most intrigued me. Having read most of his work, I finally got to meet him in Chennai in his later years and I did archival research on his manuscripts in Boston and Austin around the turn of the millennium. I particularly wanted to write a book on his work, because I felt Malgudi was all too often celebrated as a site that represented an unchanging timeless India and the opposite was true. I’d been reading cultural geography theory about the mobility of place and that informed the book that I eventually published in 2007, with an Indian edition following in 2010. Narayan and Ezekiel apart, the other Indian writer whom I admire greatly and on whom I’ve worked extensively is Amitav Ghosh. I far prefer him to many of his contemporaries who live outside India. I read and taught The Shadow Lines the year after it was first published and then went on to read all his other work. The Shadow Lines apart, my favourites are The Calcutta Chromosome, which I think is underrated, In An Antique Land and The Hungry Tide. I’ve taught and written on all of these. I think the Ibis trilogy is a monumental achievement, but didn’t personally feel the second and third parts lived up to Sea of Poppies. Last year I grappled with his ideas in The Great Derangement. Such an important book and so persuasive in its arguing that human interventions are responsible for climate change, but along with this he argues that the realist novel is unsuited to depicting catastrophic meteorological events, because it relies on what he calls “the calculus of probability” and I think this is an extremely dubious contention. More recently, I’ve become increasingly conscious that Indian writing in English as represented in the West can be very different from Indian writing at home and I think it’s important that poets such as Sunil Sharma, Sharmila Ray, Jaydeep Sarangi and yourself, reach a wider audience. Thanks to online publication, particularly in journals such as Setu, I think this is beginning to happen. During the 1980s, when I was an officer for ACLALS (the Association for Commonwealth Literature and Language Studies) and related activities, such as being a judge for the Commonwealth Writers Prize, my interests brought me into contact with several Canadian and Australian specialists and I began to read fairly widely in these areas. I covered Australian Literature for The Year’s Work in English for three years and went from being a beginner to someone who had a broad sense of the continuities of Australian writing from the nineteenth century onwards in a comparatively short time. I’ve written on a number of Australian authors, but as with African writing I try to avoid doing so now. Canadian Literature has been different for me. Part of my background is Canadian: my wife is Canadian, as well as my father. When I became involved with Canadian specialists, I asked myself why I’d ignored this aspect of my identity and set about trying to remedy this. So, I gave myself a crash course in reading Anglophone Canadian writing. I was particularly impressed by the novelists and short story writers who came to the fore in the late 1960s and the 1970s, among them Margaret Atwood, Alice Munro, Jack Hodgins and Robert Kroetsch. I worked on Kroetsch’s papers in the University of Calgary library one summer and wrote three or four articles on his work. He’s probably not known to most Setu readers and so perhaps I should say that he was the leading Canadian postmodern writer of his generation, as well as someone who was a passionate advocate of the distinctiveness of Prairie culture. Western Canada can be very different from the East and in the West there’s often a felt sense of having been historically colonized by Ottawa. A long story. Anyway, I was very taken with Kroetsch’s novels and, after I met him, he became a friend. Sadly, he was killed in a car crash half a dozen years ago. But we still have his work and I consider novels such as The Studhorse Man, Badlands and Gone Indian are major works. GL: You are best known for academic writing. Can you elaborate on Post Colonial Literature in English? JT: It’s not a term I like, though because of my areas of interest, it’s one that gets attached to me and which it’s difficult to avoid. For a couple of decades, it’s been the main term used for the field in which I work and so I tend to go along with this. Four of my books have it in the title, and in three cases it wasn’t my first choice. The publishers wanted it. The exception was a book called Postcolonial Con-Texts: Writing Back to the Canon, which discussed works that respond to canonical English texts, such as Robinson Crusoe and The Tempest. It seemed appropriate there because I was actually looking at how writers from ex-colonial countries were engaging with colonialism and “racism”. Elsewhere it’s been less appropriate. The first of these books with “postcolonial” in the title was a 900-page anthology that I put together for the publishers Arnold in the mid-1990s. It began life as The Arnold Anthology of New Literatures in English, but along the way, Arnold decided that postcolonial was the most easily recognizable name for this body of writing, and they were probably right. But there are so many problems with the term “postcolonial”, not least because it means different things to different people. Still, rather than expand on this, which I’ve done elsewhere, perhaps I could just say that, along with numerous other critics, I’ve always felt that there is a field of literary and cultural study that links writing from different parts of the world through shared affinities, which have a relationship to historical colonialism and its modern-day incarnations, such as corporate globalism. It’s concerned with literature and culture that sees the world in very different ways from Western “universalism”, which is usually spurious. Anyway, I prefer simply to get on with writing critical studies of work from these areas. I see myself as a critic rather than a theorist, though again I’ve been labelled as the latter. All too often, academic literary commentators seem to be using literature as evidence to prove particular theoretical positions and of course such criticism feeds off itself in ways that are increasingly alien to the man and woman in the street. That said, when such theorizing challenges asymmetrical power relations, such as those that lay at the heart of colonial practices, and opens up new ethical perspectives on issues such as the Anthropocene forces that threaten the very existence of human and non-human animal life, then I’m very sympathetic. Some of my more recent work on geographies has tried to engage with these issues, doing so with a focus on material realities and the ways they are represented in texts. GL: What does poetry mean to you? Where do you see it going in the future? JT: Writing poetry is mainly a pleasure for me. If I get an idea for a poem and I have the time, I start trying to develop it right away. After that, the experience varies enormously and half of my attempts never come to anything. Others go in different directions. Some of the poems are written quickly; some seem to take forever. Some are short; some are long. I suppose it’s fair to say some of my poems, such as “The Slaughter” and the title-poem of Paco’s Atlas, are influenced by my academic interests. Others aren’t in any way. Comparatively few come directly out of personal experience, though a few of the poems in Paco’s Atlas do owe a debt to that. “Grandmother” is the one poem that definitely does, though, as the speaker there says, it’s “part truth, part rumour and the rest is fiction”. I’m not sure where poetry will go in the future. At the moment in the UK performance poetry is particularly popular and poets who want to get their work are increasingly relying on readings. Perhaps it’s the same everywhere. I don’t think poetry will suffer from the switch to electronic media. The amount of poetry finding a home online is encouraging. GL: How do you approach poetry? Any thoughts on your poetry collection Paco's Atlas and Other Poems? JT: Well, as I’ve said, I’m an impulsive poet and I find it hard to generalize about how I approach writing. I get an idea and pursue it to see if it will work. Occasionally, if I feel the subject is important, I work hard to make the idea come to something and that may take a matter of hours or days. Only one poem in the collection, “The Tortoisiad”, which I call a mini-epic, took longer, but that was inevitable because it’s longer and, in some ways, more ambitious. The title was inspired as much by Pope’s The Dunciad as by The Aeneid, but the intention was to invest previously abused tortoises with heroic dignity. I dedicate the poem to a very caring Spanish-based woman, Cruz Bonilla, since she supplied much of the detail for it. The four tortoises are based on her own rescued chelonians. Sometimes I write a poem and then want to come back to the subject again. For example, “Chinese Checkers” is an attempt at writing a poem on the same theme as “Couple”. GL: Poetry is essentially a self-taught art form. Do you think if there was formal training it would help or harm? Where poetry is concerned there are a few suggestions I’ve sometimes made: to condense wherever possible, which is good advice for many, but not all, young poets, and to read the poets you think are the best in the world, while being careful not to imitate them slavishly. I think it’s useful to be aware of what has preceded you and to learn from others, but again not if that leads to imitation. I don’t think training harms, unless one tries to make someone write in a mode that is simply uncongenial to them, for example trying to get them to write in more regular verse forms or the opposite. GL: You once wrote “Writing is dreaming”. Does it get reflected on your poems and fiction? JT: I think so and particularly in my poetry. I see a poem as a space where one can unleash one’s imagination in a manner that has all the logic – or should it be illogic? – of a dream. Several of the poems in Paco’s Atlas make reference to dreams. I found the idea of writing my poem “Pragmatist” as a dream made it much more viable. I wanted to imagine the mind of a dog, while not being so presumptuous as to think one could possibly enter into a dog’s consciousness, which would be a terrible act of appropriation. So, I wrote it in the form of my attempt to dream how the world is from the pragmatic point of view of a dog. But the poem is also about a very human mindset – the mindset of someone like myself who is riddled with self-doubts. In the dream this is dispelled by the narrator’s imagining himself being totally focused in the way dogs appear to be. When he wakes up, the doubts return. Elsewhere the trope of the dream has provided me with a way of bringing fantastically imagined experiences onto the page. In “Another Night”, I link one of the great fictional storytellers Scheherazade with the Aboriginal Dreamtime and set the poem in the Alps – a crazy combination really – and then let the narrative move towards a death-defying moment of perfect rest. In “Saraswati”, I imagine the goddess as a librarian, lamenting the decline of the book culture, but dreaming of a time when a lover will come and join her in reading “vast alphabets of upright types of love”. So, although there’s pessimism in the poem, the dream holds out the possibility of moving beyond that into a pure experience that links literature and love. GL: You once lamented about your fiction ‘This is the work I value most, but where I have been least successful, though all the short stories I’ve ever written have been published.’ Why this has happened? JT: Well, it’s mainly because one of the two novels I’ve written has failed to find a publisher or agent that I’d be happy with. The other one has come out with a non-subsidy publisher and is hardly known, but that doesn’t bother me, because I was never so protective about it. I wrote it, simply for pleasure and to see it published at all seems OK. But the novel I value more, Cabinets of Curiosities, is, I think, the best thing I’ve ever written and that’s why I feel I’ve been unsuccessful. Simply because of that. Let me say something about this novel. It may help to explain. It began with my deciding to write on a theme that was never likely to prove very popular with commercial publishers: a journey into rural England, into Lincolnshire, the county where I now live. And I decided to write it in the first person, without having any preconceived idea of where the narrative would go. I simply invented a narrative voice and put my narrator into a situation where he was completely at sea. He’s summoned to Lincolnshire by the enigmatic sister of an old college friend and she’s evasive as to why she’s wanted him to come. From there it develops into a mystery and it seems one of the family he’s visiting is a murderer, though even that isn’t clear – it’s less a whodunnit than a what’s-been-done. It crosses genres and my primary interest was to write a novel about the Condition of England, while playing around with this ingenuous narrator, who finds there are numerous surprises in store for him, though I didn’t know where it was going when I launched him on his journey. Although I was his creator, I had to find out with him. As I wrote the novel, over a quite a long period of time, I became engrossed in it and took care over every word, making sure it was exactly what I wanted, in the way I would with a short story or poem. I invented characters that pleased me, even if they weren’t necessarily going to do that for anyone else! They range from a garrulous eighty-seven-year-old man to an equally loquacious eight-year-old girl. Both of these characters were developed through their voices, their particular distinctive way of speaking. And I felt the narrative all came together in a way that satisfied me, with a fast-paced and condensed ending that springs surprises on the reader, along with the narrator and initially myself, though in retrospect I suspect that I was unconsciously working towards ensuring that there would be no loose ends. Towards the end the solution to what seems to be the central mystery is revealed, but it turns out that that isn’t the final ending. There’s another twist to the tale, which has implications for the social side of the novel. Anyway, this novel that crosses generic boundaries and it moves between realism and postmodern disruptions. I didn’t compromise to meet fashionable trends in any way. So, it was always going to be challenging to bring it out with a good publisher. When I felt it was fully finsihed, I tried to find an agent who might place it with a major publisher. That’s more or less the only way to succeed in the UK and North American now. And again, I deliberately didn’t compromise by seeking the help of friends with connections. A couple of the agents I approached expressed an interest, but none has taken me up … at least so far! Now I’ve done nothing with the novel for about a year. I suppose it’s time I prioritized it and tried again. In short then, I’ve had the usual pleasure from writing it – no, that’s not quite right, I’ve had more than the usual, pleasure from writing it – but because for me it’s a success, in this case I find I do want to see it published and by a major publisher. I hope that explains. All my stories and the other novel, The Book of Francis Barber, have been published. My two favourites among the stories, “The Word” and “Himmelstein” are also available online, if anyone is interested. Stylistically I think they’re among the best things I’ve written, along with Cabinets of Curiosities and some of the poems in Paco’s Atlas. GL: Who are your favourite authors? Tell us about the writers who have influenced you. JT: I still love reading eighteenth-century English novelists, with their vast sprawling canvases, and Laurence Sterne in particular is a favourite I will always go back to. Generally, I like metafictive work – writers such as Borges and Pynchon. As I mentioned above, I’ve been attracted to the fiction of Robert Kroetsch, whom Linda Hutcheon called “Mr Canadian Postmodern”, and over the years I’ve regularly revisited Margaret Atwood’s work, reading most but not all of her new work as it has appeared. I’m probably indebted to these writers, and to Amitav Ghosh for his particular brand of non-Western humanism and, in a completely different way, to V.S. Naipaul, who, despite my lack of sympathy with his views, helped me to write shorter sentences! But when I write fiction, I’m not really conscious of any influences. In retrospect, sections of Cabinets of Curiosities may have been influenced by As I Lay Dying, my favourite Faulkner novel, but that wasn’t in my mind at the time. I’ve read most of the classics of American literature and particularly admire Melville, the Twain of Huckleberry Finn and the Fitzgerald of The Great Gatsby. I far prefer the minimalism of Emily Dickinson to the putative universalism of Walt Whitman. Writing poetry, I know I’m indebted to Derek Walcott, both for themes and the wrestling match I have with blank verse, which both attracts and repels me! I also identify with Walcott for another reason. I mentioned that during my time in Guyana, I regularly wrote newspaper articles, for Guyana’s Sunday Chronicle, and one or two people were kind enough to say that collectively my pieces constituted a manifesto for local culture. During his years in Trinidad, Walcott wrote in a similar vein and on similar subjects for The Trinidad Guardian. Of course, my articles were far inferior to his, but I still felt I was doing something similar. The poem “In the Picture” in Paco’s Atlas was inspired by Eunice De Souza’s Women in Dutch Paintings; “The Settlement” by Wilson Harris, though it owes nothing to him stylistically and it also grew out of a short trip to an Amerindian mission that I made myself. GL: You were the editor of The Journal of Commonwealth Literature for nearly two decades. Please share with us the pleasure and pain of an editor. JT: The Journal was such a big part of my life I find it hard to talk about it. Also, it went through various periods during my time as an editor. Sometimes I had a co-editor, but towards the end I was the sole articles editor. It also changed publishers more than once while I was in charge. What can I say? Most of all, it was a great privilege to see so much work, on so many subjects, and, although we used peer reviewers, I read virtually everything we received and did much of the copy-editing myself. Again, I learnt an enormous amount from this and it kept me at the cutting edge of work in “Commonwealth” and related areas. I tried to write to all prospective contributors personally – another aspect of my compulsion to write? – but towards the end the sheer volume of material I was dealing with made it hard to manage it all. Then, when the publishers brought a number of automated elements into the review system, I decided to resign, though I’d also enjoyed the contact with my Editor at the Press (Sage). Perhaps the thing I take away from it most is the virtual friendships I made through the Journal. Recently the Editor of another established journal that has been revived after ceasing publication for a number of years told me she is modelling her practice on mine. And it’s been gratifying to find that I keep in touch with a number of people who were rejected by the Journal, but seem to have appreciated that I dealt with them humanely. Of course, there may be others who feel the opposite (! ), but anyway it’s good to think that many people liked the way I handled submissions. GL: Do you think social media can have impact into your writing life, and if so, how? JT: On the whole I resist the idea that this might be so, but increasingly we live in a world where authors are expected to promote their work through social media. Many academic publishers now ask authors what social media platforms they are on, when considering book proposals that have been submitted to them, and I think that it’s increasingly likely that more and more will be expected of authors as publishers desert older forms of distribution and promotion. I do use Facebook and a couple of academic networks and did post details of my most recent critical book, Postcolonial Literary Geographies, on these sites, when it came out in 2016. Possibly related to this, there’s the issue of whether the expectations of electronic publishing affect one’s writing and I should confess that I’ve written some shorter fiction, suitable for online reading and probably shorter than anything I would have written while we were all still living in the Gutenberg Galaxy. In fact, one of the poems in Paco’s Atlas exists in two incarnations – it’s been published on a UK app for “quickfiction” as well as as a poem. That’s “A New Woman”. It’s identical in the two versions, except for the line divisions in the poetic version. GL: What are you reading right now? JT: I’m reading Neel Mukherjee’s The Lives of Others. I’ve been told it makes for an interesting comparison with The Shadow Lines, but I’m only a quarter of the way through it and so I haven’t really formed an opinion. And in between reading that, I’m currently caught up with reading three manuscripts that publishers have asked me to assess. I do a fair bit of this kind of reading, which is good because it helps to keep one abreast of recent developments, but three at once is unusual – at least one too many! It means it’s taking me longer than I expected to read The Lives of Others. GL: What final words you would like to share with us? JT: It’s been a pleasure talking to you, Gopal. We met last month in Kolkata, at a very pleasant poetry reading evening. Prior to that, someone I’d met in the city had emphasized the extent to which “culture” permeates virtually every aspect of Bengali life. I’d already seen some evidence of this and that evening showed me more, as did several other experiences I had during my time in Kolkata. I was very impressed and that will stay with me as an abiding memory. I love Mumbai, which I’ve visited several times, and could see one or two superficial similarities between the two megalopolises, but despite all the wonderful people I’ve met in and around Mumbai, despite the pleasure of being with several writers, artists and academics there, and despite the kindness with which I’ve been treated there, I think it has to cede pride of place to Kolkata as a city of culture. Perhaps more to the point it puts most Western cities to shame in this respect. full of HD light and slender poise. but it starts to get too long. to a laptop or a desktop screen. it fears it may never be read. Thank you Setu, thank you Sunil Sharma for posting the literary interview. Both the interviewee (James Thieme) and the interviewer (Gopal Lahiri) are in good form. Enjoyed perusing the article. Sorry for the typo: it should read John Thieme.